Okobe Thila is a popular and colorful dive with a lot of large friendly Napoleon fish that greet you. Okobe Thila or Barracuda Giri is inside the Bodhu Kalhi kandu east of Bandos about one hour sailing from Male'. This is a dive for experienced divers due to the frequent strong currents. 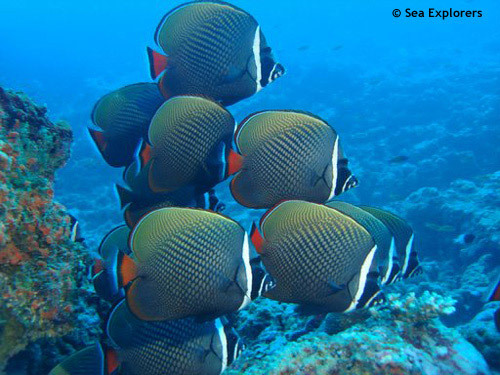 The dive site consists of two thilas that lie off the main reef. There is a permanent mooring line attached to one of the thilas along which you can make your descent and ascent. Due to the small size of this pinnacle, part of this dive will be spent swimming against the current. The pinnacles are covered with a stunning array of colorful soft corals, sea fans and acropora. Large schools of banner fish, fusiliers and triggerfish surround you as you make your way around them. On the top of the reef are many anemones with their inhabitant clown fish and large number of colorful feather stars. Sharks, barracuda and Napoleon wrasse are frequently spotted. Manta rays may be seen here during the southwest monsoon.